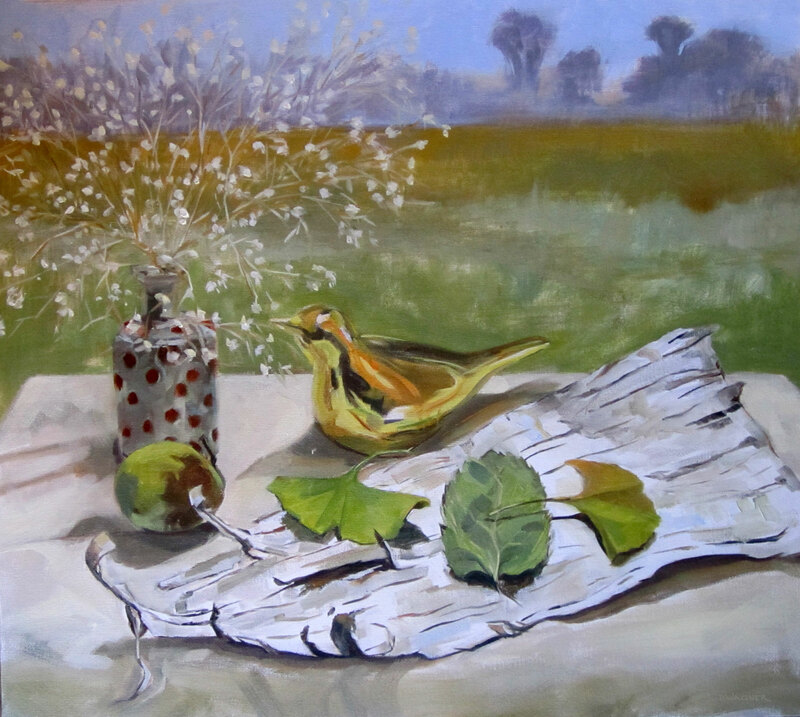 Here is another attempt at a plein air still life (found out I don’t need the hyphen unless it’s used as an adjective). The dried baby’s breath and the little spotted vase have been in my house for a long time. The gold bird is a flower vase I bought in St. Louis three or four years ago. The leaves, rapidly drying walnut and birch bark are from more recent outings. I’m enjoying composing still lifes with various objects. I tend to labor them a bit, but find the time very restful and enjoyable. I painted this in oil on Fredrix unstretched canvas and hope to mount it to a hardboard for framing. It’s a non-standard size, around 16×18, I reckon. Hope you enjoy my ‘collection’. This entry was posted in Still Life and tagged bark, birch, bird, ginko, gold, leaf, leaves, polka-dot, walnut. Bookmark the permalink.